Gun smuggling: how many guns do Customs seize every day? Our FOI applications seeking information on how many illegally imported firearms Customs has seized has revealed some interesting information. Around 8 guns, imitation firearms, parts and accessories detected each day are disposed of – either from a prosecution or not being able to identify the owner – and that’s obviously the ‘tip of the iceberg’. This will be important information when it comes to the remaking of our Firearm Regulations 2008, as it challenges the often-held view that illegal guns come from the legal market. 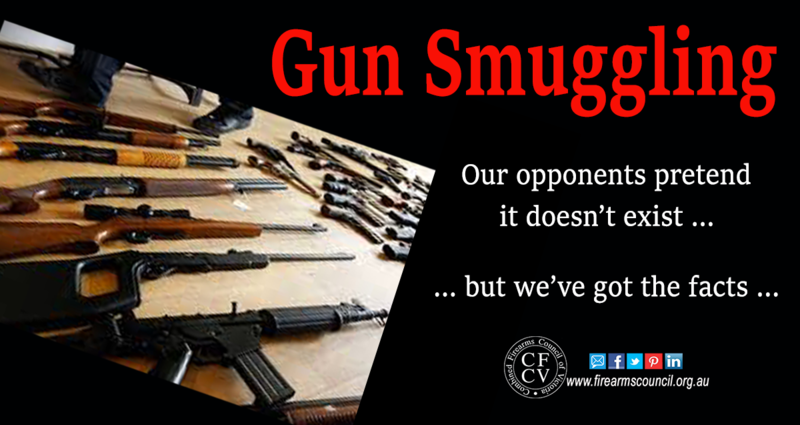 How many guns are smuggled? In 2015, the Federal Senate held an inquiry into the impact of gun-related violence in the community. It started as a spearhead by the Greens, and ended up with shooting organisations (including some of our own full members) being able to defend our current system and raised more questions which others do not have answers to. One of those questions was the contribution illegal imports makes to the supply of illegally held firearms. While many submissions and witnesses pointed to this, no-one was able to quantify the problem, which is understandable when you consider the nature of smuggling. You might recall this earlier blog on this topic. In that article we show that the amount of cargo coming into Australia on a per Customs officer basis is comparable to holding the key of a car among 20,000 others, and having to find out which car the key starts. It’s worse than being a needle in a haystack. However Customs and the AFP do seize firearms, so we thought we’d put in FOI requests to see what information they had – even though it could never reveal the complete picture. The response we got from Customs (or more accurately, the Department of Immigration and Border Force) came in two parts. The first part, which was about ‘detections of undeclared’ firearms, parts and accessories, shows that over the five year period 2011-12 to 2015-16, they ‘detected’ 9,000 items, an average of 4.9 a day. Some ‘detected’ items may be legally released later on (ie after the production of the required paperwork) so the number of those which were ‘disposed’ drops to 947, an average of half an item per day. The second part, which was about detections of undeclared “imitations, air guns, parts and accessories” is more revealing. Over the same 5 year period, the number of ‘detected’ items was over 20,000, an average of 11 a day. The number of items disposed was 13,800, an average of 7.5 a day. Not only are these numbers higher, but so is the percentage of items ‘disposed’. The total number of firearms, imitations, parts and accessories ‘disposed’ therefore tops 8 a day. It is reasonable to assume that many of these came through the post and weren’t claimed by the owner. As a former Customs Officer, I know how hard it is to prove that the addressee of an undeclared item (whether it is firearms, drugs, quarantine or something else) ordered it, without being able to trace payments. The response provides only a glimpse on the extent of illegal imports, but it is the first verifiable information we have seen on the subject. As the existence of firearms on the ‘illegal’ market is often used by regulators to justify tighter storage requirements, we’ll use this to question their assumptions when our own regulations in Victoria are rewritten this year. We thank the DIBF for helping us with this request and proving the information sought. Their help is greatly appreciated. The AFP was, however, less helpful. Our interest with the AFP was what firearms they seized which could not be associated with a legal source (ie guns were not picked up by Customs or made locally). After months of being uncooperative, their response is that they do not have documents which identify this. .. and yes, I’m ex AFP as well. The fact they don’t have these records doesn’t surprise me. The work you people are doing is in my mind brilliant. A common sense approach such as this is so very much needed. Well done CFCV. Please keep up the good work,and don’t let these groups? (all funded by WE THE PEOPLE)be fair and honest in all reporting,as we as shooters are expected to be. Firearms ‘that disapear’ FROM CONTAINERS ARE NOT REPORTED. As the crime of their THEFT, is considered NOT TO have happened In AUSTRALIA. Congratulations on a brilliant article.